When was the last time you paid any attention to your crawlspace vents? Did you know that you should open the vents in warm months and close the vents in winter? Most people assume that the vents should be left open year round. In Southern states where the temperature is warmer, it is not as crucial to close the vents. However, if you live in an area where temperatures fall below freezing, your vents need to be closed for the winter. Standard crawlspace vents use a thin screen to repel insects and keep them from getting into your home. Unfortunately, in the picture below, this insect screen didn’t keep the mice and snakes out! Snakes commonly enter through crawlspace vents following the mice and rats that have invaded your home. 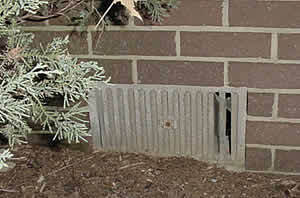 Installing automatic crawlspace vents will eliminate the need to remember to open and close them as the seasons change. These vents will automatically respond to the ambient air temperature and fluctuate the opening when needed. These vents also provide peace of mind by keeping unwanted wildlife out of your crawlspace or basement. Secure your home or business with an automatic vent installation. Our professionals at A All Animal Control will be glad to assist you will all your vent system needs. With our automatic vents, you won’t have to bother with manually operating them again! One less thing to worry about! Temp vents are also another name for automatic ventilation systems installed in crawlspaces.